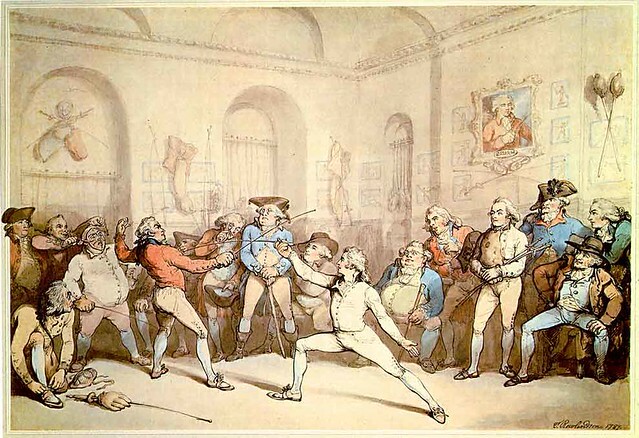 Early fencing masks are depicted by Rowlandson (1787) as two fencers prepare to bout. The kneeling figure’s mask lies nearby while the standing figure has his mask tied on by the figure over his shoulder. Detail from “I Shall Conquer This” by Thomas Rowlandson, 1787, a view of a bout at H. Angelo’s salle in London. Click to view entire image on flickr. The fencing mask that modern fencers would recognize as such was not invented until the latter half of the 18th century. However, that’s not to say that there were no fencing masks before this time. Before that time, a fencing masks would have looked like a theatrical mask with a full-face covering and eyeholes; it would have been affixed to the fencer’s head by tying the connected ribbon behind the fencer’s head. Still, such masks were not widely used and, obviously, did not protect a fencer’s eyes. However, not everyone immediately adopted the fencing mask. For instance, in 1778, Maître d’Armes Nicolas Demeuse noted that the mask’s advantage was “not only ignored but unknown in many [French fencing] academies.” He advocated for using mask, noting that, because it is essential to keep one’s face “intact,” you cannot take too many precautions against preventing any “deformities.” But his concern was more than vanity: Maître Demeuse went on to provide an example of a young prevôt who, without wearing a mask, was giving a lesson to one of his friends in the salle. During the lesson, the friend’s foil broke, the end of the foil entered the prevôt’s skull through eye socket, and, horrifyingly, the prevôt instantly collapsed dead on the salle floor. Despite such gruesome cautionary tales, masks still seemed to have been disfavored for quite some time. Even by 1845, the mask was not always used for drills: in his Theory of Fencing, Gomard published rules for particular fencing drills and flatly says that such drills should be done “sans masque”—that is, without a mask. A fencer in a bout with a mask, 1821. Detail from “Jerry’s admiration of Tom in an ‘Assault’ with Mr O’Shaunessy at the rooms in St James St.” by Robert and George Cruikshank. Click to view entire image on Flickr. To understand why 19thcentury fencers would have run such an unnecessary risk given potentially catastrophic consequences, we have to understand the culture at the time. Due to its history, French fencing was historically one way that a person established his social standing by demonstrating his grace and self-control. Putting on a fencing mask showed you questioned your opponent’s ability to keep his blade away from your face, implicitly challenging your opponent’s grace and self-control. Given French fencing’s obsession with politesse, this was simply too much for the sensibilities of the better fencing establishments. Thus, the mask was not always used. Beside the implied insult to one’s fencing partner, some traditionalists disfavored La Boëssière’s mask. Not without reason, they argued that, due to its protection, the mask would induce fencers to take risks that they otherwise would not. For them, the danger of an unmasked face in the fencing hall properly mimicked the danger of the dueling ground, keeping fencers’ actions appropriately conservative. Thus, the fencing mask objectionably divorced a bout in the salle from the realities of an actual duel. Of course, even when fencers did use masks, accidents continued to happen, leading to injuries. An 1818 French medical treatise described the clinical aspects of such an injury. In this case, the two fencers were masked and equipped with “buttoned foils.” The attacker (a fencing master) thrust at his opponent. Whether by design or through a bad parry, the master’s thrust hit the mask at the defender’s right eye. Although the mask was sufficiently durable to stop the thrust, the strength of the master’s attack snapped his blade. And, with such momentum, the broken blade continued, penetrating the mask’s grill, puncturing the defender’s forehead, and—as is sadly predictable by now—entering his skull’s interior. Although given quick medical treatment, the poor fellow died several days later due to complications. By 1904, French physicians were making safety recommendations for fencing equipment. In order to prevent wounds to the face, for instance, one physician recommended that, rather than being frontally rounded, fencing masks should be shaped like a boat’s hull, as they are now. “In this circumstance, there is a much greater chance that a foil’s tip will never hit perpendicularly on the mask, such that it can divert tangentially.” The doctor went on to suggest that, for safety’s sake, the grillage should cross at right angles and be welded at each junction, while the foil tip should be at least five millimeters wide. This entry was posted in Equipment, History and tagged Demeuse, Gomard, history, injury, La Boëssière, mask, Morgan, safety. Bookmark the permalink. Doña Ana de Mendoza y de la Cerda was a 16th Century aristocrat who lost her eye in a fencing duel at an early age. See formal portraits of Mendoza here.